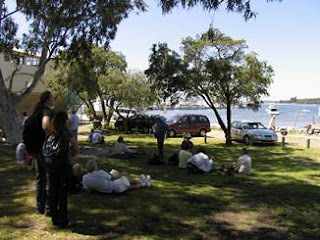 The 2008 Bush to Beach walk traversed the Mosman Park penninsula from Cottesloe to the river and back again. Over 50 walkers participated on a beautiful sunny Sunday morning. Thanks to Lesley Shaw and Peter Spriggins for organising it for us! 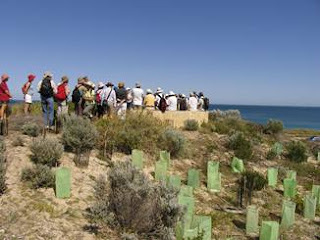 Robyn Benken introduced walkers to the work being carried out by Cottesloe CoastCare. We had a welcome break at Mosman Bay with refreshments put on by the Mosman Bay SeaScouts - thanks guys! 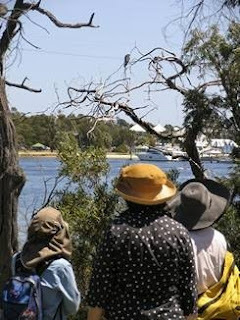 We saw a black shouldered kite as we approached Minim Cove in Mosman Park.